Light in color with a bright, acidic nose and flavors of Meyer lemons and Key limes in the mouth. Pairs well with seafood and creamy soups. Recommendations: Ok, full disclosure, I picked up this wine at my local Costco while doing some shopping because the name of the vineyard caught my eye and I just couldn’t resist. I figured it would be funny, and would give me the opportunity to write about a bad Sauvignon Blanc. I was half right. 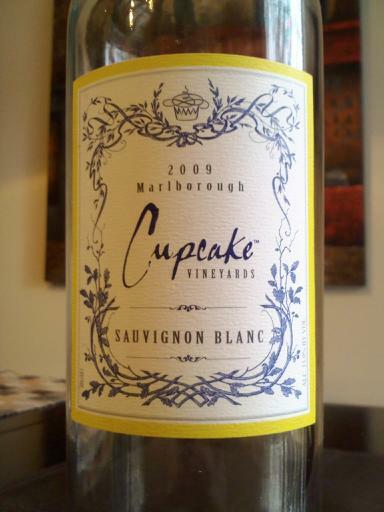 I’m not going to say that this is my favorite Sauvignon Blanc by any stretch of the imagination, but for an $8 wine that I can enjoy on the deck during the warm days of Spring and Summer while munching on some light food, it’s hard to beat the Cupcake Vineyards Sauvignon Blanc. Good citrus flavors, though absent the grapefruit that I’ve come to love from South American Sauvignon Blanc, it was light and refreshing on a warm afternoon on the deck and the wife and I were rather surprised by it. I’m not saying I’m going to rush off and buy a case of it, but I’d certainly consider picking it up again when I’m doing my regular shopping at Costco. While you can certainly do better than this wine, and for not much more, you can also do a lot worse. If you’re looking for a cheap deck wine it’s worth a try, especially for the price.